Sun Peaks Evening Fondue and Descent - Great Fun! The Sun Peaks Evening Fondue and Starlight Descent is something we very much enjoyed (twice so far) and think you will too. It is a unique dining and night-time Sun Peaks skiing (or snowboarding) winter experience which is popular with visitors as well as employees and local area volunteers who work the event and all pitch in to make this a fun, safe and popular winter event at Sun Peaks. 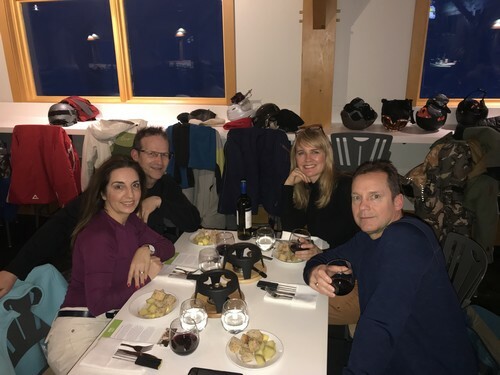 The fondue nights typically only happen once or twice a week during the winter (Wednesday and/or Thursday in typically) and you need to register in advance to ensure a spot as these tend to book up. Cost is only around $85/person, you need to be around 14+, and you need to confidently be able to ski or snowboard down green runs at a minimum. The Sun Peaks Evening Fondue is Delicious! Once you’re registered and signed up for the Sun Peaks Evening Fondue, you then just need to show up at the Sunburst Express chairlift in your full ski gear around quarter to 5:00pm for a ski-lift ride up to the newly-renovated in 2017 Sunburst Bar + Eatery (mid-mountain restaurant - home of great cinnamon buns during the day!). Once seated at long tables and you’ve had a chance to meet other visitors from around the world, enthusiastic servers (some employees, some volunteers) will come and take your drink orders (starting in 2018 there is now a full bar there but drinks are an extra charge) and then bring the first round, which is a fondue pot of delicious melted cheese and a plate of rustic bread pieces, boiled potato, and some pineapple. Yes - that's right, pineapple! The delicious melted cheese is a combination of Appenzeller, Gruyere and Emmental cheeses, as put together by the new Executive chef from Switzerland, Hans Stierli. The bromelain in pineapple is apparently an excellent aid to digestion and helps make room for the next delicious course. And it does actually go fantastic with the unique cheese blend! Helpful hint: Let the staff know of any allergies when you sign up so they can do their best to accommodate you. Live music sometimes happens in the background, but if not there is canned music, and servers come to ensure everything is going ok. You may be interrupted with information about what you are eating or what is coming next, if there is a special announcement or perhaps a birthday song to belt out. The food was very enjoyable and there was lots of it, along with plenty of opportunity to chat with those around you. 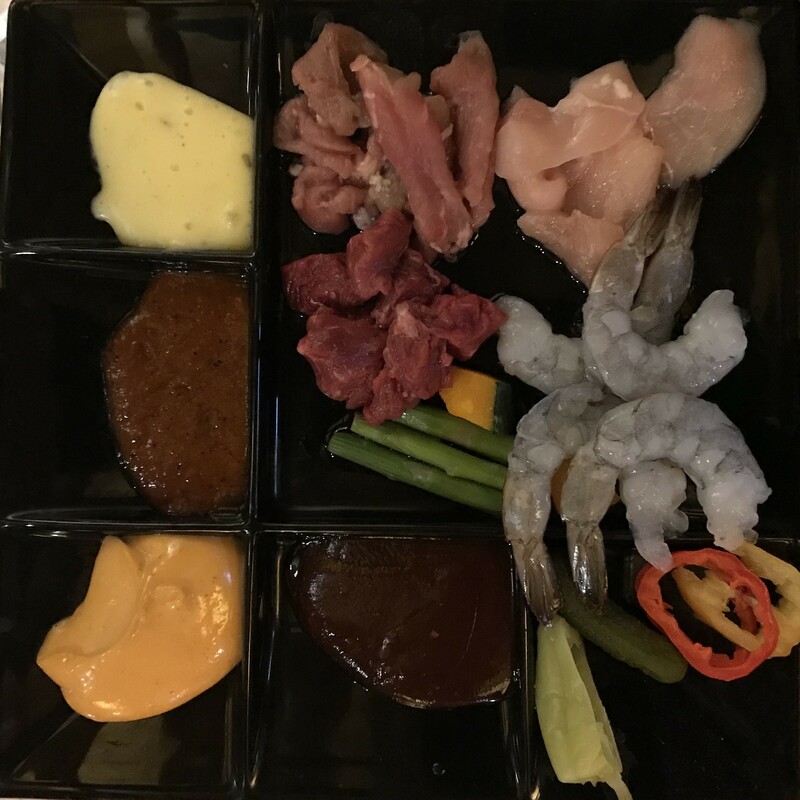 Once the cheese dinner fondue pots and plates are cleared away, a heated broth fondue pot and a plate of high-quality raw meats and vegetables is brought out, including beef tenderloin, chicken breast, pork tenderloin, tiger shrimps, asparagus, pickled peppers and squash. The meats are cut quite thin so they cook quite quickly while you enjoy casual conversation with others at your table. There are also three different sauces to dip and enjoy with your meat. And once you have had chance to enjoy the meats and vegetables and the plates are cleared away, the smell of melted chocolate soon fills the air as hot pots of dark Swiss chocolate are brought out. Each person gets a plate of strawberries, bananas, marshmallows and a shortbread cookie, which all taste wonderful dipped in this delicious chocolate blend. Once done, the drinks finished, and the pots cleared away, the excitement takes hold as guests are handed their headlamp and organized into groups. After thanking your server, gear up and get ready for the fun Sun Peaks Evening Descent down the 5 Mile Run. I was a little nervous before-hand but there was no need – it’s great fun! The groomers typically hit this trail while you’re enjoying the fondue so it is in great shape, and lanterns are placed along the right hand edge to keep you away from a slight edge and to mark the way down. Your guide will stop frequently to gather the group and ensure everyone is ok.
You are surrounded by darkness and silence, except for the skiers with headlamps before and behind. Stop to look up, and if you’re lucky the sky will be lit up with stars, the moon, and perhaps even a bit of the Milky Way or even the Northern Lights? The Sun Peaks evening fondue is a delightful and unique experience that soon comes to an end right down at the village base. Once there, you can talk about the experience with other guests, hand over the head lamp, and head back to enjoy your hot tub or perhaps enjoy some libations at one of the Sun Peaks pubs. If you're not confident of your skiing ability in the dark, or want to enjoy the experience with a non-skier, you can book a Sun Peaks snow-limo ahead of time, and still enjoy the full Sun Peaks Evening Fondue and Descent activity. Cost is around $150 with a snow limo ride down. Note: Applicable taxes will be added to all prices. Rates are in Canadian dollars. Dates and prices may be subject to change without notice. Some restrictions may apply. 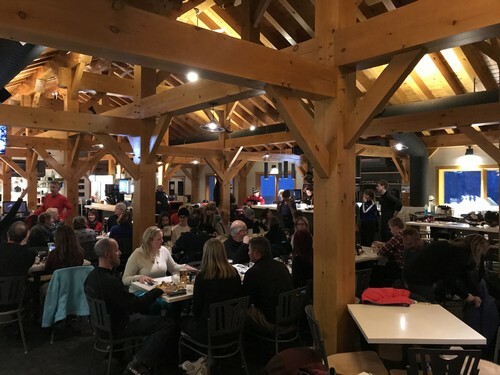 For more information or to make a reservation contact the Adventure Centre located in the Village Day Lodge, call 250.578.5542, or click to view the Sun Peaks Evening Fondue and Descent page. After you try this, let us know what you thought, or perhaps recommend another Best Sun Peaks Activity for others to enjoy. Another unique dining experience to consider is a high-end, catered dinner party from Bottoms Sun Peaks Catering. If you need luxurious Sun Peaks vacation rentals, check out our Best Sun Peaks condo in Stone's Throw or our Best Sun Peaks townhouse in Trapper's Landing.